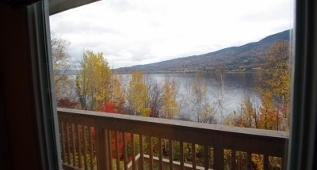 Waterside Lodge is a waterfront property with an elevated setting offering panoramic views over Deer Lake. A flight of stairs and a path offers direct access to the beach. The Lodge is situated below the road at the end of a long drive. The Lodge offers extensive open plan living and dining spaces on the main floor and a separate lounge area on the second floor which offers views out over the lake through the floor to ceiling glass windows. The property also offers a large lobby/mud room and a separate laundry with full size washer and drier. 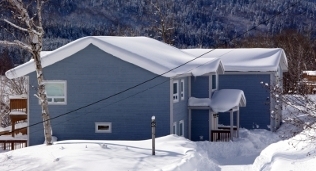 Waterside Lodge offers 4 bedrooms, two king bed master suites with whirlpool tubs and large walk in showers, one extra-large queen bed suite and one family suite which is available in different configurations. All bedrooms are en-suite. 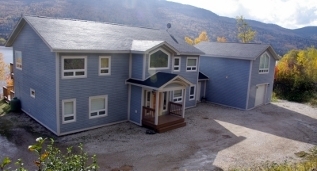 The property features extensive deck space for outdoor living in summer with an available hot tub inset into the deck. Hot tub available at an extra charge. Minimum 5 night stay. Discounts apply for longer stays.